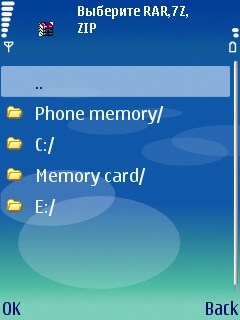 Our last post was about WinZIP mobile , an application for opening ZIP archives in Symbian mobile phones . Like ZIP format , there are other compression/archiving formats like RAR and 7ZIP . WinZIP mobile cannot be used to open RAR and 7ZIP formats . So here we can use WinRAR mobile ,which is a Java application that can open ZIP,RAR and 7ZIP archives in Symbian Nokia ,LG,SonyEricsson and Samsung mobile devices .Download WinRAR for mobile devices . WinRAR mobile is written in Russian language . Application will show a message for accessing files and folders . Allow the action and select ZIP /RAR/7ZIP from memory card that are to be opened . SonyEricsson Walkman series , Cybershot series and many other phones are supported . I’m unable to download winrar mobile….its saying bandwidth exceeded….plsssss do somthng…..